Art and science are often treated as distinct realms, but sometimes they overlap in unexpected ways. A neuroscientist, for example, creates a chart based on how an animal’s brain responds to rewards. The chart is informative to scientists who can interpret it—but it is also a compelling, monochrome image reminiscent of an iconic album cover. That neuroscientist is named Sean Cavanagh, of University College London, and his artwork based on the neural responses of rhesus macaques, called Unknown Variability, won the 2017 Art of Neuroscience competition. This competition has been held each year since 2011 by the Netherlands Institute for Neuroscience (NIN). NIN has existed in one form or another since the early 1900s and carries out research into brain function. Recently, the competition has opened up to include artists and their own interpretations of the brain. We know a great deal more about how the mind works than we did when NIN was founded, but there are still gaps in our understanding. Artificial intelligence is being taught to appreciate, and even create, art, for example, but the biological nature of creativity remains at the edge of our knowledge. This competition both provides scientists with the opportunity to tap into their inner Dalí, Miró, or Pollock, and offers a visual representation of research into the mysteries of thought and behavior. 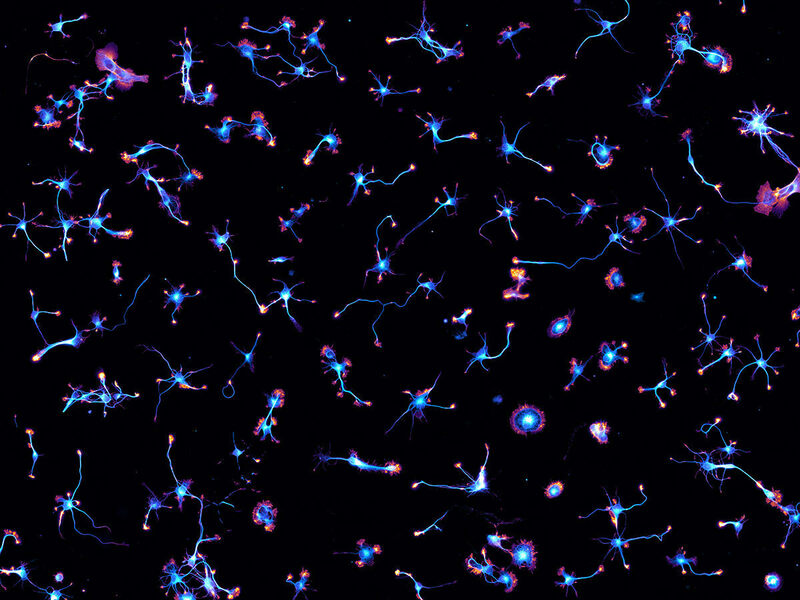 For the nonscientist, it might be difficult to understand “somato-dendritic morphology,” but it’s easy to appreciate its beauty when it is represented as a multicolored mosaic. The artwork featured in the competition is strangely absorbing. Starry Night shows iridescent blue sparks dancing across a dark background, like bioluminescent sea creatures or distant galaxies. But the image was created by neuroscientist Christophe Leterrier of the NICN Institute in France, as part of a study of hippocampal neurons. In other images, branches of a Purkinje neuron glow like lightning, or a cross-section of a spinal cord creates an autumnal landscape. Cavanagh’s winning entry, in a further cross-pollination of art and science, was created to resemble the cover Joy Division’s 1979 debut album Unknown Pleasures—which is a depiction of radio waves taken from an image in the 1977 Cambridge Encyclopedia of Astronomy. Like the study of astronomy, the brain also represents a “final frontier.” The pioneering research of neuroscientists enhances our knowledge of the brain and can potentially help in the treatment and prevention of neurological disorders. Atlas Obscura has compiled a selection of images from the Art of Neuroscience. Butterfly of the Soul, Honorable Mention 2016. Myelinated axons in the mouse brain, based on electron microscopy data. Robin Scharrenberg. Archival photographs show the spectacle of babies who went on display, in an effort to save their lives. A deep dive into the "submarine landscapes" of Louis Boutan.